Well, I don't cook. I shouldn't cook. I'm not going to cook ever again... I tried getting some food together last night for my lovely wife and I... it was just some sausages... and, well, the fire alarm went off. ADT called right away, but the alarm went off again, and that disconnected me from the ADT service center. In the minute it took me to grab the number from the drawer and grab my cell phone, the fire department had already been mobilized. 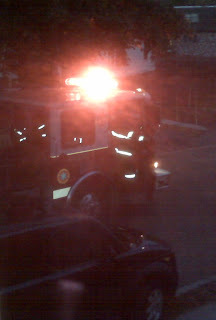 ADT was able to convey a message that we were NOT being toasted, but the fire truck was already down the street (yep, I could hear the sirens), so they still had to come to the house to make sure everything was okay. The whole neighborhood came out to see what the commotion was, and sure enough, it was just me, cooking. I'm now only authorized to use the coffee maker and the microwave, and even those are only with a probationary period. Ah, KT. Sadly, I've only been up to the North East Kingdom a couple of times this year--way too few. Perhaps it was the $4.00+ gas, perhaps it was my schedule, but gas prices dropped and I had a free weekend, so when Ron proposed another trip up, I jumped on the chance. I was going to race a 'cross race in Maine on Saturday and then head over to VT in the afternoon, but a closer look at the map had the 'cross race in Maine farther up than I really felt like driving, so I did some "stuff" around the house and shot straight up to VT Saturday afternoon. Luna and I stayed at our friend Jo's house. She's got a great B&B pretty close to the trails and over years we've become friends (I stayed there for 6 weeks while in PA school). Anyway, Saturday night involved pizza and beer and then I was asleep. I a woke Sunday morning to temps in the low 20's... 21 degrees F to be exact. DAMN, that's cold. Fortunately, Ron and Todd were running a bit late so the temps warmed up to perhaps the 40's by the time we hit the trail. I think I saw a new prototype Thule roof rack while on my drive up to Vermont. Looks slick, and it looks like it will work with any bike, regardless of frame design or fork type. Way to go! I don't know the final results, but I did well on the first two. I ran a technically clean race with no falls. And as for the work-out, I raced for 45 minutes with an average heart rate of 175 with a max of 185 bpm with a total of about 1200ft of climbing for the just over 9 mile course. That's 45 minutes of max effort! Riding home from work Thursday night, I had an issue. I know what happened, but I'm not sure why. If you're not interested in details about bike mechanics, you don't need to bother reading anything after this following paragraph. Here's the deal for me... I flew over the bars, slid on my hands and elbows on the pavement for a bit (no gloves! ), and decided to bleed for a bit. 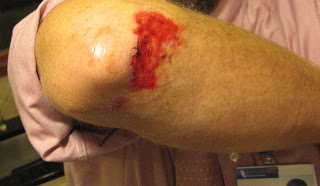 I limped the final mile home, and thanks to Jean's urging, made sure not to bleed on anything in the house. Oy! We cleaned and dressed my wounds and the next morning the wonderful nurses at Beverly Hospital finished the job. I've been dutiful in my wound care, keeping them clean, covered, and moist, all to promote healing and reduce the risk of infection. In fact, with my hands wrapped correctly, and covered in good gloves, I can even hold handlebars! Okay, so here's what happened. Somehow, the lockring on the rear cassette backed out/loosened up, allowing the smallest cogs to come off the splined freehub body of the rear hub. Unfortunately, this didn't happen slowly... it happened SUDDENLY, and while I was cranking up a short hill in the big ring. The sudden loss of resistance from the rear wheel flung my weight forward and put me off balance enough to result in my graceful splat. C'mon epidermis, grow!